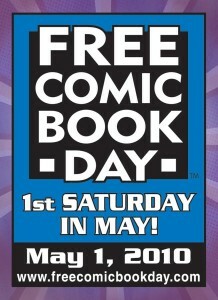 As comic book fans across North America know, last Saturday was the annual Free Comic Book Day. FCBD is an ingenious promotion that publishers and stores across the continent have developed to encourage new readers to try out comics and graphic novels. 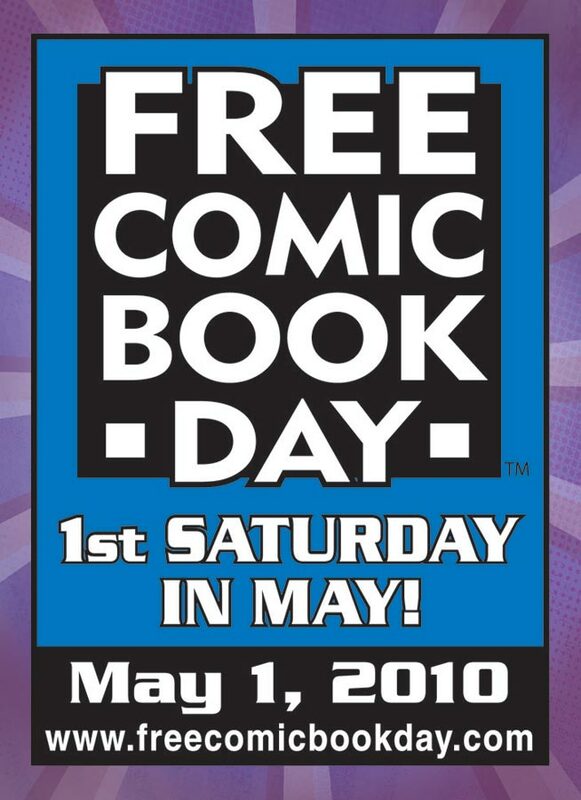 It’s a simple concept: on the first Saturday in May most major comic book publishers release free copies of comics which the stores hand out to any and all customers. The idea is to get new patrons into the stores and to introduce older fans to new titles or creators. Although I’m a big-time comic book nerd, this was my first experience with FCBD. I went to Paradise Comics, my Local Comic Store, and dragged my girlfriend Katy along. Boom! Studios – Irredeemable/Incorruptible double-sided: This was actually the last comic I picked from the spread. It just so happened that the Incorruptible cover was the one facing up on the table, and that’s what drew me in. Of course, Mark Waid’s story is great and as these are reprints of both series’ first issues, this was a perfect jump-on for new readers. I’d read Irredeemable before, and think its concept of superhero-turned-ultimate-villain is fine. Certainly, Waid does an excellent job of building a sense of dread and terror as Superman-analog the Plutonian rampages around the world. The only problem is that it’s been done before. Watchmen, the Dark Knight Returns, Rising Stars and the Squadron Supreme, amongst others, have broached these themes before. It’s not that Waid does it better or worse than these other titles, it’s just well-tred territory. Incorruptible, however, is brilliant. It chronicles the reaction of supervillain Max Damage to the Plutonian’s berserker rage and his decision to prepare to fight the hero. I am hooked. I want more, and that’s what Free Comic Book Day is all about. IDW – G.I. Joe #155 ½: I’m definitely a fan of G.I. Joe but this comic did nothing for me. The Joes themselves are only mentioned in one panel of the comic. Although there’s a great deal of action, the plot relies heavily on past storylines from earlier G.I. Joe comics. I can see that some people might be intrigued by Cobra Commander’s scheme to take over the United States, but it seems like a very continuity-heavy book that could turn off new fans drawn in by the recent live-action movie. Maerkle Press – Love and Capes #13: I’d heard good things about this comic from the Invincible Super-Blog and an interview with creator Thom Zahler on an episode of the War Rocket Ajax podcast. As usual, Chris Sims and Eugene Ahn didn’t lead me astray. It was a fun, light-hearted read about the newly-married Crusader and his wife Abby as they adjust to their new life together. The humorous vignettes of what it’d be like to be a married superhero were good for some laughs and Zahler’s artwork is clean and expressive. Archie Comics - Archie’s Summer Splash #1: Written and illustrated by Dan Parent, this comic is exactly what you’d expect from the good folks at Archie. It’s a fun, one-and-done book centred around a minor social conflict between average American teenagers. 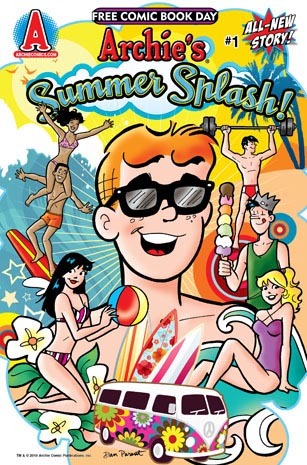 I appreciate that Archie Comics put out a brand new story for FCBD and one that can be easily understood by any new reader. I’m just sorry that it doesn’t really focus on the main four Riverdalians (Archie, Jughead, Betty and Veronica). Sure, they’re there, but they could have been anyone. That said, that’s my only complaint. Parent strikes again, doing a solid job of writing and illustrating this story. Marvel Comics - Iron Man/Nova: Along with the Incorruptible half of Boom’s efforts, this was the best comic I read on Saturday. Specifically labelled as “Great for all ages”, this book is fun and easy for any fan to understand. Craig Rousseau’s artwork is very detailed while remaining light and easy on the eyes. Writer Paul Tobin squeezes a lot of exposition into the dialogue between Nova, Iron Man and Kate McMillan but manages to keep the plot moving. I like the choice of heroes as well. Obviously, Iron Man’s inclusion serves as a tie-in to Iron Man 2 which comes out in just one week. Nova is an odder choice as he’s got a lower profile than most characters, but since he is going to be a member of the new Secret Avengers book coming out this month his inclusion also makes sense. Nova is also more accessible for younger readers, since he’s a college student, an everyman in the vein of Spider-Man. Also, it features monkeys and apes. Who doesn’t love simians? Marvel Comics - Iron Man/Thor: Inversely, this is the worst comic I picked up on Saturday. In theory, it should’ve been great. As mentioned above, Iron Man has starred in a wildly popular movie with another one coming out in a few days. Thor’s movie is in production and is a cornerstone of the Marvel Universe. There’s a lot of buzz surrounding the characters. Matt Fraction is one of the hottest scribes in the industry right now, writing the monthly Iron Man and Thor titles. Penciler John Romita Jr. is one of the best comic book artists ever, and a mainstay of Marvel comics. Again, you’d think a creative team like that would be a slam dunk. Unfortunately, this story is confusing as all hell. Both characters are kind of jerks, not just to the villains but to each other as well. It’s hard to place when in continuity this happens and it ends on a puzzling note with Thor flying over a wrecked supertanker in the green fields surrounding Ayer’s Rock in Australia and Iron Man standing on the moon before a bunch of wreckage that includes a sign for Stark technology. Not the kind of gateway to two monthly titles that Marvel was probably hoping for and a disappointment to fans familiar with the characters or creators of this issue.